The University of San Francisco School of Management executive MBA program lasts 20 months (60 credits), beginning in August. Classes meet one series of days per month, held on a Thursday, Friday and Saturday from 8 a.m. to 6 p.m. (with an included one-hour lunch break and an additional pair of 15 minute breaks). 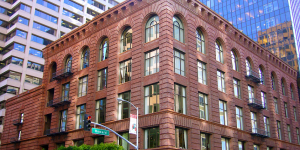 Those classes are held exclusively in the downtown USF campus in SoMa. A week-long international trip is held early in the second year of the program. Students entering the program are expected to have at least eight years of experience, including two-to-three years of managerial experience in order to handle the workload of the executive MBA classes. Nineteen classes are included as required courses, all of which aim to assist students overall understanding of four principles: leadership, decision-making, global social responsibility and foundational business knowledge. Approximately 42 students are in the current USF EMBA program, which is 57.1 percent female students and 42.9 male students. These students are, on average, 38-years old and scored a 430 on the GMAT. Graduate students enrolled in any of the USF MBA programs will have access to the Graduate Career Management Pool, which gives students access to career advisors as well as a wealth of content that will assist in development. The resources included are: webinars; assessment tools; resume templates; international opportunities, jobs and internship postings and a map of local events. The total cost of the 60 credit program is an estimated $89,500. This includes the $25 AGUSF fee, paid each fall and spring semester. Many students can finance their degree through corporate sponsorship via their employer or through a reimbursement policy, wherein the student earns the money they paid for the program back after it is successfully completed. Applicants to any of USF’s MBA programs are eligible for a number of partial-tuition scholarships. All domestic applicants are also eligible for federal student loans. Students applying for the executive MBA program at the University of San Francisco must have at least eight years of professional work experience with two-to-three in some management capacity. Like the other MBAs USF offers, applicants must submit official copies of transcripts from any previous college or university, a copy of a résumé, two letters of recommendation (at least one from an official professional contact). Applicants must submit both a 500-word ‘Statement Of Purpose’ and a 500-word self-evaluation. International applicants must submit either a TOEFL, IELTS or PTE score. The minimum TOEFL scores are: 100 (internet-based) and 600 (paper-based). The minimum IELTS score is 7.0 and the minimum PTE score required is 68. All international applicants born in native-speaking English countries are exempt from submitting any test scores. As well, international applicants seeking an F-1 visa in additional to admittance into the program will not be accepted. The school suggests that applicants from East Asian countries take an International Skill Verification Services (ISVS) and the International Study Candidate Assessment Process (ISCAP), but it is not required. All applicants admitted into the program will be interviewed before-hand by invite only. GMAT scores are accepted but can be waived on a case-by-case basis. What is the Most Valuable San Francisco MBA?